The Volvo Group is now taking the next step in the development of sustainable transport solutions. In collaboration with the Swedish Transport Administration, the Volvo Group will study the potential for building electric roads, where city buses can be charged from electricity in the road at the same time as the bus is in operation. The benefit is quieter and more climate-smart public transport. A 300- to 500-meter electric road may be built for test operations in central Gothenburg during 2015. “Vehicles capable of being charged directly from the road during operation could become the next pioneering step in the development towards reduced environmental impact, and this is fully in line with our vision of becoming the world leader in sustainable transport solutions. Close cooperation between society and industry is needed for such a development to be possible and we look forward to investigating the possibilities together with the City of Gothenburg,” says Niklas Gustavsson, Executive Vice President, Corporate Sustainability & Public Affairs of the Volvo Group. With the use of an electric road, vehicle batteries would continuously be charged wirelessly during operation by transferring energy from the electricity grid to a vehicle, instead of charging the bus while it is standing still at charging stations. The technology being studied is called inductive charging, whereby the energy is transferred wirelessly to the underside of the vehicle by equipment built into the road. The Volvo Group will develop a detailed proposal within the framework of innovation procurement from the Swedish Transport Administration. The proposal entails building a road section equipped with wireless charge technology and developing vehicles that will automatically charge their batteries when passing such a road section. The road will be built along a suitable bus line in central Gothenburg and be tested for public transport. Experiences from such a test track will provide valuable knowledge for future political and industrial decisions for establishing electric roads. For several years, the Volvo Group has been offering hybrid buses with a traditional diesel engine that is supplemented by an electrical engine to reduce CO2 emissions. 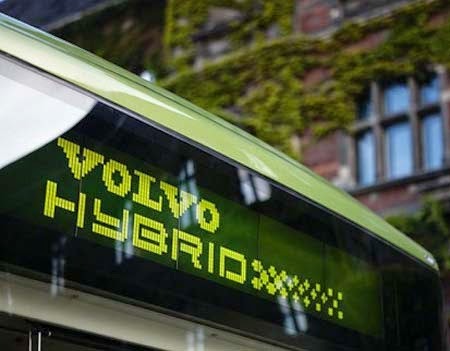 Three Volvo plug-in-hybrid buses are already in operation in Gothenburg (project Hyper Bus*), which charge their batteries at the end stations of line 60. The next stage of development is for these types of buses to be able to charge their batteries while in operation, thus increasing the distance the buses can run on pure electricity. And this is exactly what will be studied now. In 2015, a new bus line, ElectriCity, will become operational between Chalmers and Lindholmen in Gothenburg. This line will also provide additional knowledge of charging technology and electric power for heavy vehicles. “We are working on both a broad and a deep basis to develop the technology of tomorrow. Electric roads are another important part of the puzzle in our aim of achieving transport solutions that will minimize the impact on the environment,” says Niklas Gustavsson.